Diary Did get to watch the terribly sad fate of the German football team being knocked out by Italy. There’s sad, isn’t it. Many of the battlefields of the Boer war are also around this area, all started over a “debt” of £500,000 owed by the Boers to the British and used by the British as a cynical excuse to annex Boer lands and ending up costing the long suffering British taxpayer £200,000,000 along with countless deaths on both sides and the ignominy of giving the name “concentration camp” to the English language as large numbers of Boer civilians were rounded up and put in special camps where many succumbed to disease and malnutrition, not a noble episode in the history of the British Empire by all accounts. In fact you do get the distinct impression that the British made rather a mess of the whole of southern Africa on the whole. 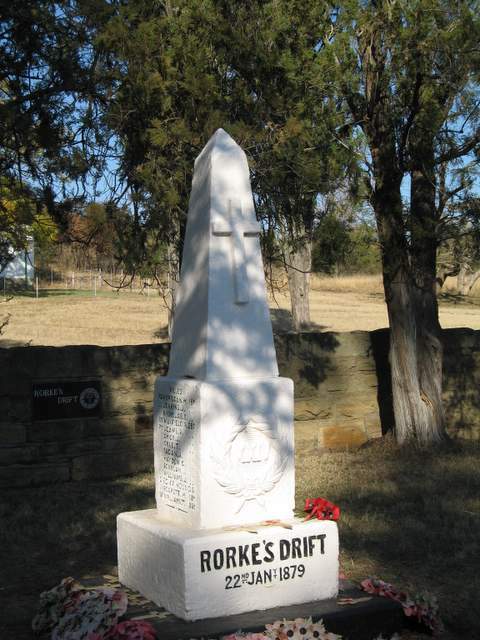 PIC SHOWS: MEMORIAL AT RORKES DRIFT.